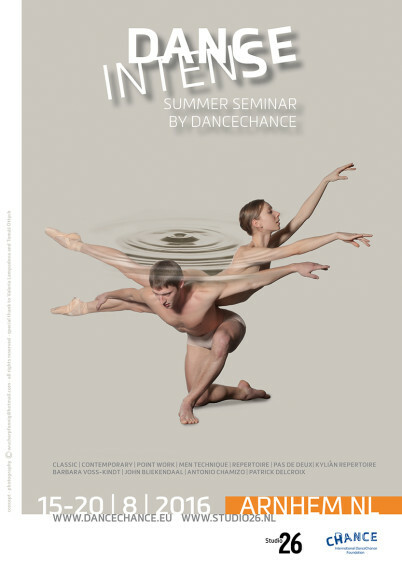 The International DanceIntense Summer Seminar 2016 is a rigorous one-week ballet and modern dance program. If you love dance and are looking for a way to develop your skills, keeping in shape during the summer and looking for teachers who give you a personal coaching, guidance and advice, DanceIntense could be a great choice. Not only are you doing something you love, but this educational summer DanceIntense program is an enrichment for every advanced student/professional dancer developing her/his technical and artistic skills by working with our international well-known teachers. Artistic directors and choreographers will be invited to come and watch during the seminar. The program is designed to refine technique and performance of various styles of dance through a variety of courses of renowned choreographers, ending in a student presentation performance at the end of the seminar. with Studio26 in The Netherlands.